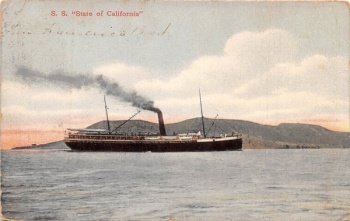 State of California (#115645) (1878-1913), 306-foot iron-hulled steam-driven passenger and cargo ship built in Philadelphia for the Pacific Coast Steamship Company with a home port of San Francisco. 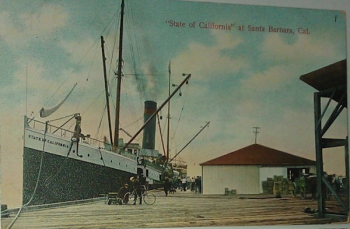 She carried cargo for the Santa Cruz Island Company in 1910, 1911, 1912, and 1913. In 1913, invoices show she made almost weekly Wednesday island deliveries of everything from ointments and spices to long-life shoes and stable brooms. In 1913 alone, through July 3, a total of 22 deliveries had been made. On August 17, 1913, the State of California was wrecked in Alaska due to an uncharted hazard. 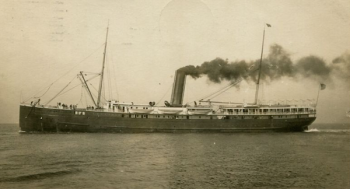 There were 150 people on board at the time, and 31 perished. Her popular running mates at the time were the Santa Rosa and the Queen. This page was last edited on 28 November 2017, at 07:58.